I'm a lifelong modeller and took up model engineering over fifteen years ago, so when the opportunity to become Editor of Model Engineers' Workshop magazine came up, I had to take it. I try to make the magazine one I would want to read. 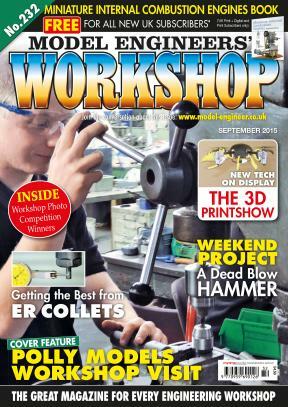 We have a great mixture of articles to suit everyone from beginners to the most experienced and cover topics of interest to anyone with a small engineering workshop - not just model engineers but car and motorcycle restorers to clock-makers and even astronomers! As well as news and reviews, every issue contains practical articles from machine restoration and modification to workshop equipment to build from scratch. We also have probably the busiest and friendliest forum for the hobby at www.model-engineer.co.uk, so as well as reading the magazine, you can discuss it with like-minded hobbyists - and share your workshop achievements.